Pumpkin pie, cozy sweaters, warm drinks and leaves falling, I couldn’t be more happy that fall is here! I know that not everyone loves fall as much as I do but let’s forget about the end of summer and cold coming, and focus on the positives. One of the great staples of autumn is pumpkin flavoured everything: pumpkin spice lattes, pumpkin pie, pumpkin muffins, the list goes on. This year all we have in our garden are pumpkins, so I anticipate many pumpkin recipes will soon be pulled out and Mom and I will have a “bake day” to use some of it up! So getting back to the basics, I decided to paint pumpkins on my nails. These little pumpkins are so adorable and are not as time consuming as many of my designs are. 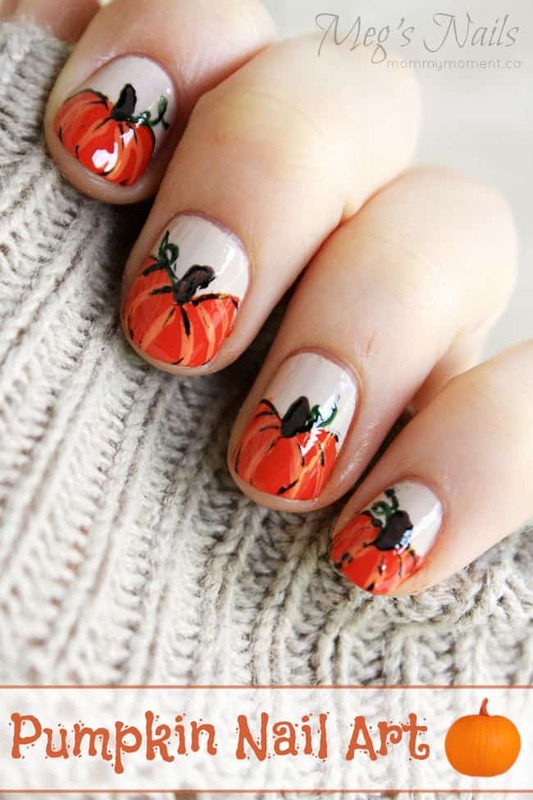 If you aren’t up for painting pumpkins on all your nails, you could simply paint one on your ring finger to start with. 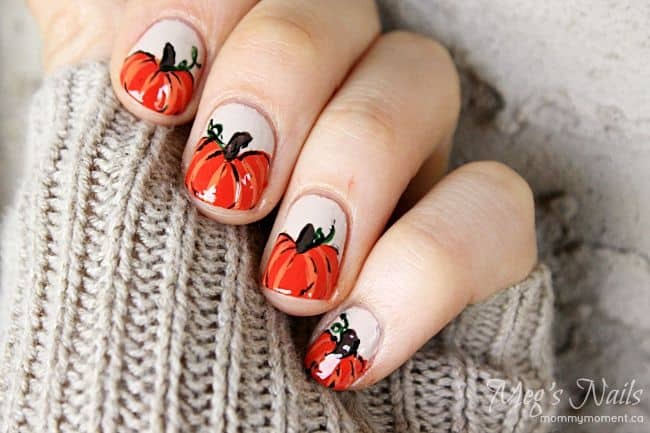 I do hope you try out this cute autumn nail design, and while you’re at it, go make something pumpkin flavoured too, and make the most of this fall! « 10 Fabulous Fall Decor Ideas for your home! Oh, I love these nails! They are so cute for Halloween and Thanksgiving! Interestingc I’d actually pull this off. I attempted palm trees on my toes and it turned out great! I Love this nail art for Halloween! Very nice Megan, love the pumpkins!! I really like this nail art1 Great idea! Very well done and so cute!